What a lovely day, the sun is shining and people are smiling! It has been an amazing day at the shop and it is so true: there is nothing more rewarding than fantastic customers that are so positive towards you. It sure makes me feel like what we are doing is right! And it gives me tons of energy and the urge to get back to the shop sooner. Well Lovisa will start nursery next week (yes of course I have very mixed feelings) which should give me more time to focus on the shop and of course the very longed for webshop. 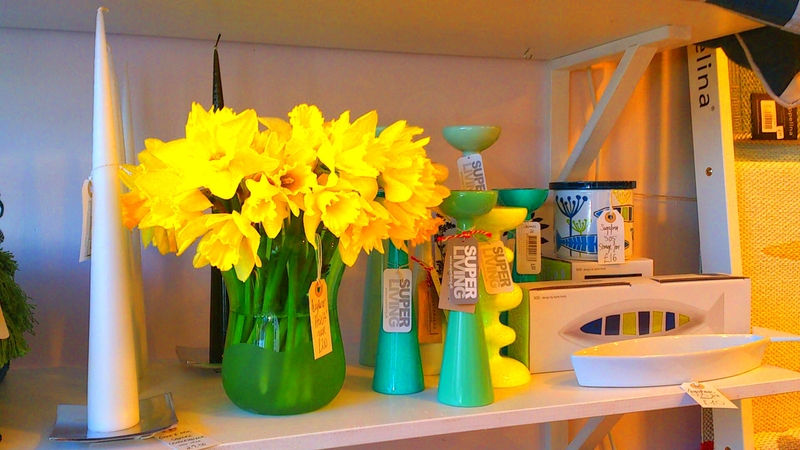 The shop is starting to fill up with Spring designs and Spring flowers such as Daffodils, oh flowers sure makes me happy. I think I need to keep going with the flowers, it does make people smile! Spring, Daffodils in Aqua vase!